Have you ever seen a Vermont covered bridge? Scroll down this page to see images of covered bridges in the state of Vermont and to read a little about their history. This page was written before Hurricane Irene destroyed or damaged so many covered bridges in Vermont. Read it as a tribute to what has been lost and to remind yourself of the cost of maintaining our heritage. Per square mile, there are more Covered Bridges in Vermont than in any other state in the U.S. Residents in Vermont cherish their covered bridges, not minding the way a driver has to slow down and often wait for an oncoming car to travel through the bridge first. When I lived in Vermont, I sometimes went out of my way to cross a covered bridge on my way to and from work. I even remember one occasion when the covered bridge was closed for repairs and the wide detour I had to take made me late! My employer was not impressed with my excuse, but I often chose to go that way again, though usually on my way home! In Vermont, as elsewhere, covered bridges were built in the days when horse and buggy was the main form of transportation. People had a different sense of time and movement than we do today. Sometimes it's fun to slow down our own lives and think about what it would have been like to live when the roads were full of horses and people moving on foot. Visiting covered bridges in Vermont or other places helps us do just that. Have You Ever Been on a Covered Bridge in Vermont? Never been there, but I've seen them in pictures, so only in my dreams. I've never seen them before. Yikes! I'd better get to Vermont! I used to live near some of these! Why So Many Covered Bridges in Vermont? And Why Are They Covered in the First Place? Covered bridges were built with a roof for one very good reason -- weather! Because in the 1800's bridges were built mostly with wood, and because Vermont experiences challenging weather during the long cold winter, bridges were built with a roof to keep the snow off the crossing surface. This minimized problems with horses and drivers sliding off into the river, but the main reason they were covered was to protect the wooden structure itself. If a bridge had to withstand heavy packs of snow each year, not only would it become impassible for long stretches, but the weight of the snow and the tendency of the wood to rot would mean that the bridge would have to be replaced often, costing a lot of moola. Builders were not just trying to build an attractive structure. They were using their ingenuity to solve the problems of travel in their day. What Do You Think -- Are Covered Bridges Still Useful? Or Are They Just Museum Pieces? Yes, they still have a purpose! Covered bridges are beautiful and are quite useful on less traveled roads. Covered bridges are still useful and they're part of our history and cultural heritage. I can't wait to see them when I go to Vermont in August. I love taking photos of covered bridges. Around this area they have rebuilt several which make them useful. However, there are a few that are very old and not usable the way they currently are. Since I love covered bridges so much, I believe they could be useful in the country and not so much in the city. The longest covered bridge in the U.S. crosses the Connecticut River between Windsor, VT, and Cornish, NH. This covered bridge, which stretches 449 feet, is also the longest two-span covered bridge in the world. It was built in 1866 for the whopping fee of $9000. Built as a toll bridge, the Cornish-Windsor covered bridge was bought by the State of New Hampshire in 1936 and was made toll-free in 1943. There is still a sign that hangs over the bridge that says, "Walk Your Horses or Pay Two Dollars Fine." That sign itself conjures to mind some of the ruckus that must have erupted in the days when horses met each other inside the dark covered bridge, along with pedestrians and maybe even a bicycle or two. How Much Did It Cost to Cross the River Through a Covered Bridge? In the 1800's, people often had to pay a toll to cross a covered bridge. Tolls were used to defray the costs of building and maintaining the covered bridges. Information credit from the Vermont Life Magazine webpage. The video clip is short, but Fox News interviews the woman who filmed the collapse, too. 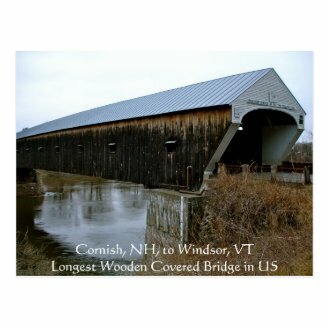 Photographs and historical information about Vermont covered bridges. 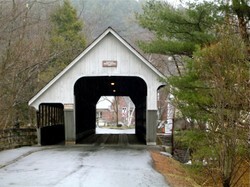 Wikipedia list of Vermont's covered bridges. Gives exact location, span, date of construction, and other tidbits of information. There's a sign like that on the Windsor, VT, to Cornish, NH., bridge: Walk Your Horses or Pay Two Dollars Fine. I am trying to find information on a white sign I have that reads "Walk your horses $10 fine" in black lettering. Thinking it is from the NH or CT area.... any information would be greatly appreciated. I've crossed that Tunbridge bridge, too, Evelyn. Thanks for your comment! I often drive across the covered bridge in Dummerston and occasionally cross covered bridges in Tunbridge or Williamsville. As a child I remember driving through the covered in Townshend. It is now closed to traffic but you can still walk across it which I do every chance I get. Thanks for all your comments! I hope those of you who haven't yet had the chance will get to cross those wooden structures someday. It is a little bit like stepping into the past. I love little bits of history like this. 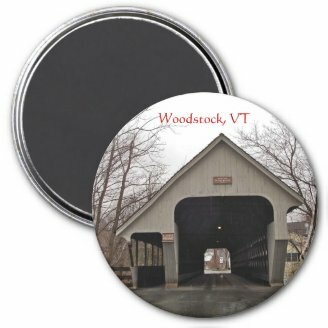 I've never visited Vermont but now I know what to look out for if I do! There's a covered bridge I cross between Brandon and VT Rt 30 to get to my daughter's house in Hubbardton. It's one lane wide, and you need to slow down to look ahead to see if there's someone crossing before you venture across. Love it. It never occurred to me people might have to pay a toll. Interesting. You know....I was simply devastated that I didn't win the HGTV Dream Home in Stowe. One of the reasons I fell in love with the area was the pictures of these bridges! They're just so charming and inviting. Love them! Vermont is a delightful place to stay for the weekend. Come stay at Evelyn's Bed and Breakfast in Royalton, Vermont.